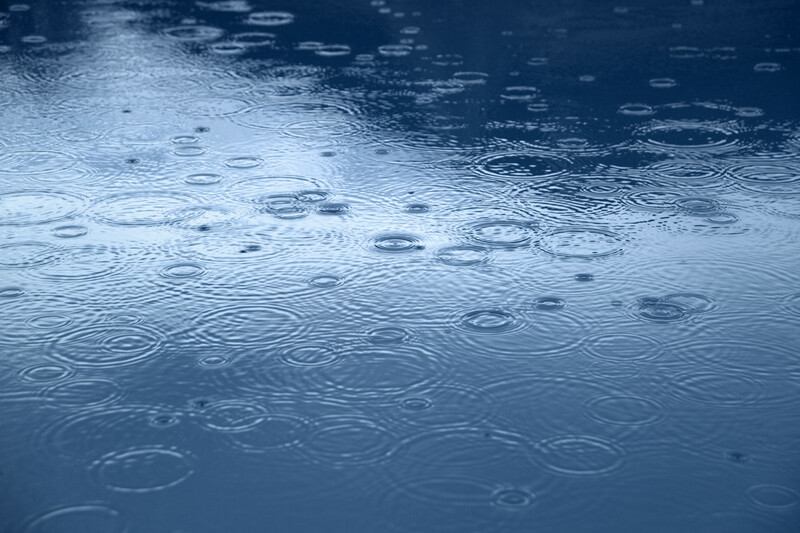 As the seasons change, preparations and adjustments must be made to anticipate the onset of rainfall, especially in areas that have experienced a wildfire. 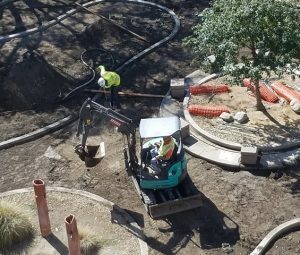 Although the weather forecast for this week will eventually rise in temperatures, residents that live in areas that have recently burned are presented with unique challenges when rain is forecast. Supervisor Robert Lovingood invites residents affected by the Blue Cut Fire to attend an open house to learn about assistance for removing asbestos and debris from their property. 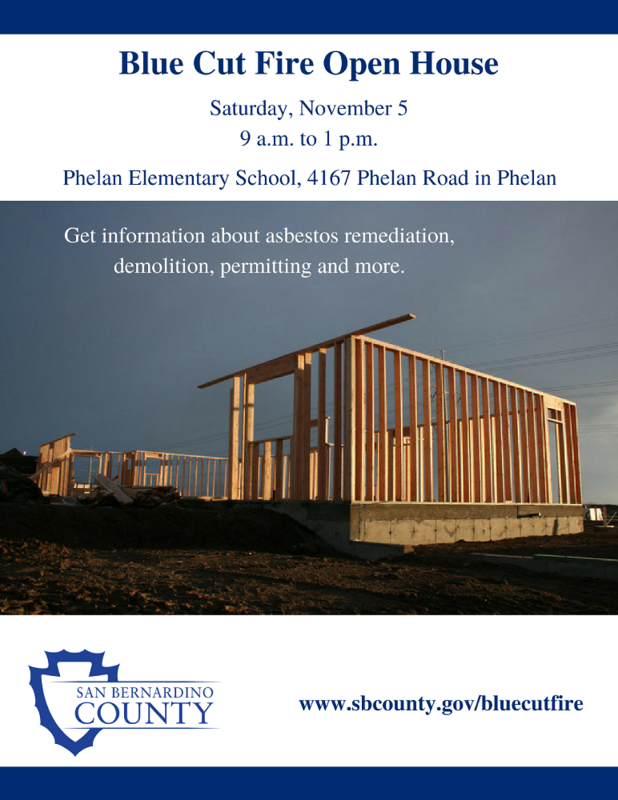 The open house will be held on Saturday, Nov. 5 from 9 a.m. to 1 p.m. at Phelan Elementary School, 4167 Phelan Road in Phelan. Residents will be able to access information about Community Development Block Grants and zero-to-low-interest loans that may be available to them to remove asbestos and prepare to rebuild. They can also get information about building and fire permits, water wells, and debris removal. Representatives from County agencies including Community Development and Housing, Code Enforcement, Solid Waste, Building and Safety, Fire Marshal, Environmental Health and Behavioral Health will be available. Nonprofit groups such as the United Way will also be present to help victims with any other fire-related needs. For more information about Blue Cut Fire resources, please visit http://www.sbcounty.gov/bluecut. 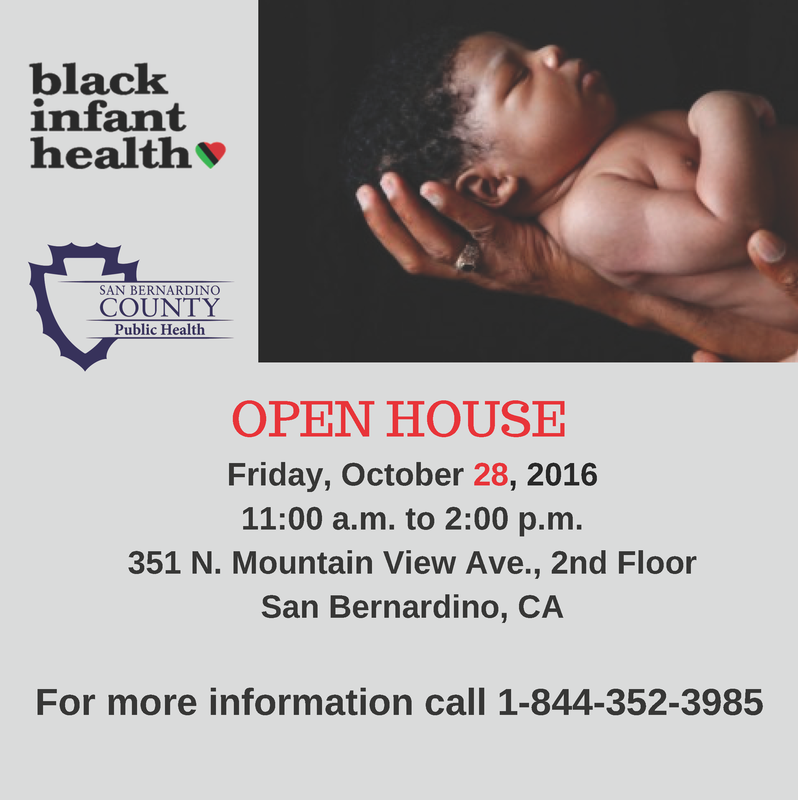 Black Infant Health has a new facility! Join us at our Open House on October 28, 2016 from 11 a.m. to 2 p.m. and see our new facility and receive a tour. The program aims to improve health and to reduce disparities among African-American mothers, babies and pregnant women, and to empower women to make healthy choices for themselves, their families, and their communities. Call 1-844-352-3985 for more information. The County is continuing its ongoing effort to reach out and provide assistance to victims of the recent Blue Cut Fire. The county’s latest effort is focused on helping property owners deal with asbestos testing and removal. Many if not most of the homes and other buildings destroyed or damaged in the fire were built when asbestos was commonly used in many aspects of construction. 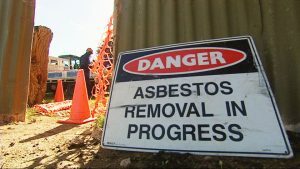 Asbestos has since been deemed a highly hazardous material, and state law requires that it be collected and disposed of in accordance with specific protocols. Asbestos cannot be dumped in regular trash bins or taken to county landfills. Testing debris for asbestos and removing it are both costly, and ordinarily these costs would be the sole responsibility of the property owner. There are no standing government programs to assist property owners with the costs of asbestos testing and removal. However, as a special service to victims of the Blue Cut Fire, the San Bernardino County Board of Supervisors has set aside funding to cover the cost of asbestos testing and to assist with the asbestos remediation and demolition process. The county is distributing this informational flyer in both English and Korean to property owners affected by the Blue Cut Fire through the Internet and social media, at the front counters of county and other public agency offices, direct mail, and in-person. Join more than 500,000 people who live and work in San Bernardino County by practicing how to Drop, Cover, and Hold On at 10:20 a.m. on Thursday, Oct. 20 during the Great California ShakeOut Earthquake Drill. What can you do to get ready for the ShakeOut? 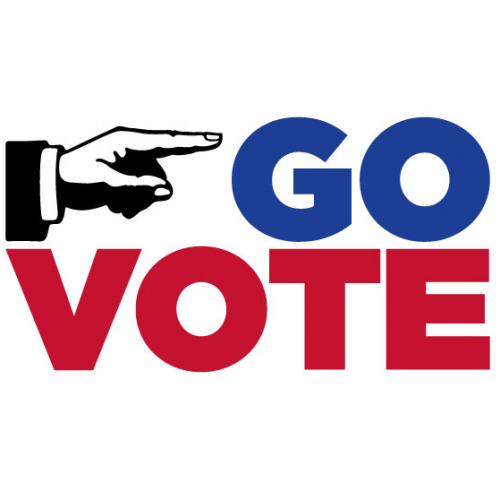 Click here for a flyer to familiarize yourself with what to do when the shaking starts. If you, or a member of your household, are a person with a disability or have access or functional needs, click here for other tips and things to consider during an earthquake. 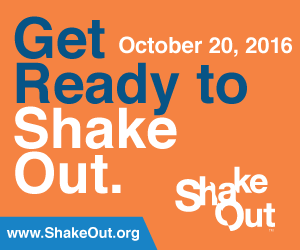 Register your family here as ShakeOut participants. Watch this video to learn how to respond appropriately during an earthquake. This video gives great advice to businesses and employers about how to prepare for an earthquake. San Bernardino County Sheriff’s Deputy Tracy Klinkhart has even more earthquake safety tips for you in this video. Share your ShakeOut day photos and videos using the hashtag #SBCShakeOut and we’ll share them on the County’s social media accounts. A human resources leader with a depth of experience managing large and complex organizations has been selected as San Bernardino County’s new director of Human Resources. Cindi Peterson Tompkins begins leading Human Resources on Oct. 31. 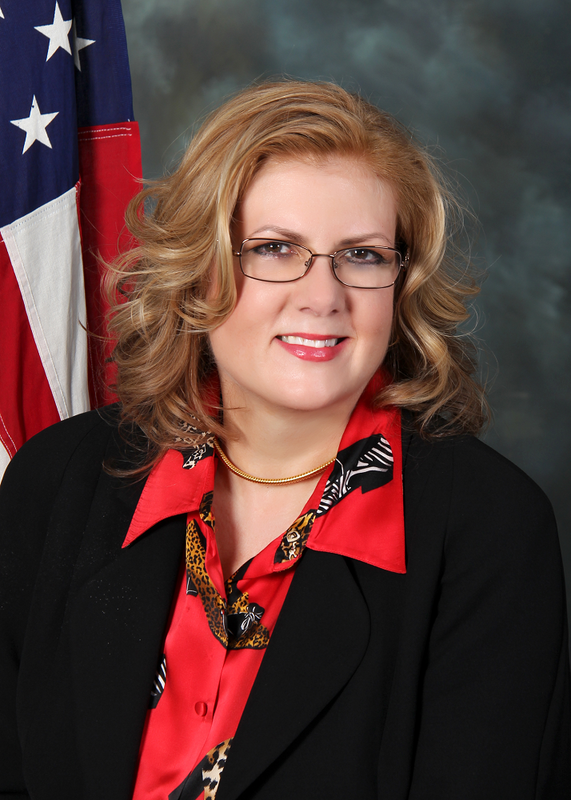 She will be in charge of providing services to the County’s 22,000 employees and managing a staff of 143 and a budget of $18 million. Tompkins served as a past board member of the Prudential Advisory Board for the Prudential Corporation and was an instructor at the University of California, Riverside Extension where she taught employee and labor relations and human resources strategy. 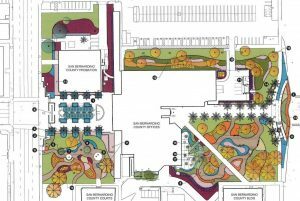 She also was a human relations commissioner, a charitable coalition board member, and served on the public space and facility naming committee – all for the City of Redlands.